Kennedy Space Center, Florida. December 4, 2013. NASA’s Orion spacecraft is just about ready to turn up the heat. The spacecraft’s heat shield arrived at the agency’s Kennedy Space Center in Florida Wednesday night aboard the agency’s Super Guppy aircraft. The heat shield, the largest of its kind ever built, is to be unloaded Thursday and is scheduled for installation on the Orion crew module in March, in preparation for Orion’s first flight test in September 2014. The heat shield began its journey in January 2012 in Colorado, at Orion prime contractor Lockheed Martin’s Waterton Facility near Denver. That was the manufacturing site for a titanium skeleton and carbon fiber skin that give the heat shield its shape and provide structural support during landing. They were shipped in March to Textron Defense Systems near Boston, where they were used in construction of the heat shield itself. Textron installed a fiberglass-phenolic honeycomb structure on the skin, filled each of the honeycomb’s 320,000 cells with the ablative material Avcoat, then X-rayed and sanded each cell to match Orion’s design specifications. 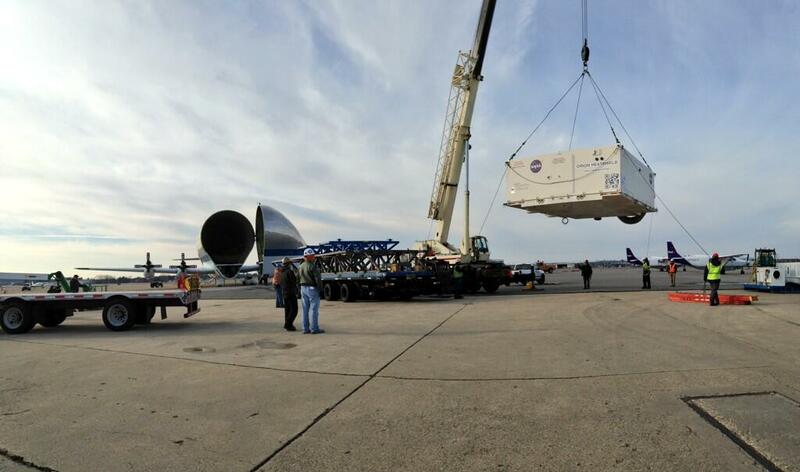 The Avcoat-treated shell will shield Orion from the extreme heat it will experience as it returns to Earth. The ablative material will wear away as it heats up during Orion’s re-entry into the atmosphere, preventing heat from being transferred to the rest of the capsule. Before and during its manufacture, the heat shield material was subjected to arc-jet testing NASA’s Ames Research Center in California and NASA’s Johnson Space Center in Houston. Arc jets heat and expand gasses to very high temperatures and supersonic and hypersonic speeds, thus simulating the heating conditions that a returning spacecraft will experience. The heat shield delivered to Kennedy will be used during Exploration Flight Test-1, a two-orbit flight that will take an uncrewed Orion capsule to an altitude of 3,600 miles. The returning capsule is expected to encounter temperatures of almost 4,000 degrees Fahrenheit as it travels through Earth’s atmosphere at up to 20,000 mph, faster than any spacecraft in the last 40 years. Data gathered during the flight will influence decisions about design improvements on the heat shield and other Orion systems, authenticate existing computer models, and innovative new approaches to space systems and development. It also will reduce overall mission risks and costs for future Orion missions, which include exploring an asteroid and Mars.